Part of a local business development which had long-been campaigned for, Markham Vale is a new-build example of a service area which puts brand names first. First two hours free for all vehicles, after which cars must pay £8 and HGVs, caravans and coaches £14.99, or £19.99 to include a meal voucher. Prices are paid in the Spar shop within the filling station, with instructions in each car park. The Starbucks here is also operated by Euro Garages. The service area is not signed from the motorway, but it is visible and advertised as a motorway facility by Euro Garages. 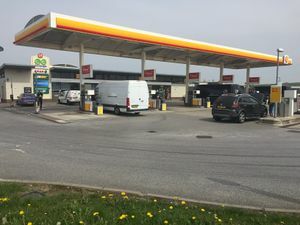 The trend of offering fuel and a restaurant next to a motorway junction is very American in nature, and becoming increasingly common in the UK as brands such as McDonald's become more popular and planning laws are relaxed. The Ordnance Survey now shows Markham Vale as a full motorway service station.